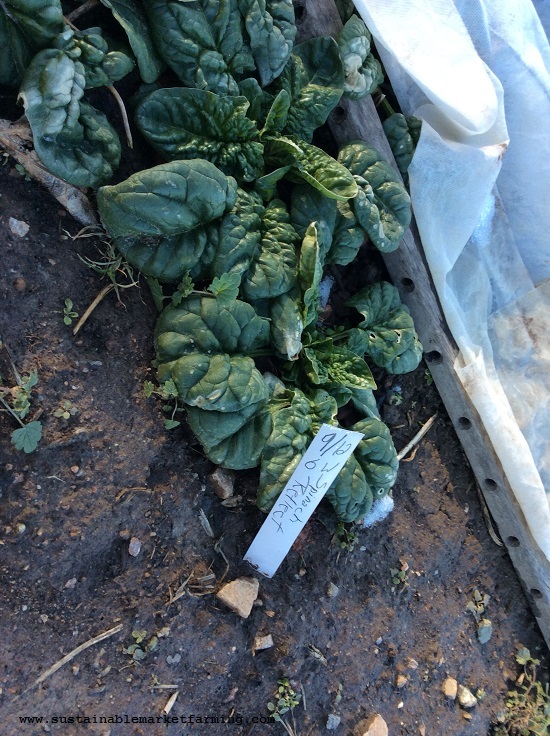 Avon spinach in our hoophouse October 25. For years we grew only Tyee savoyed spinach. It did very well for us in central Virginia. It survived our zone 7a winters outside under rowcover. 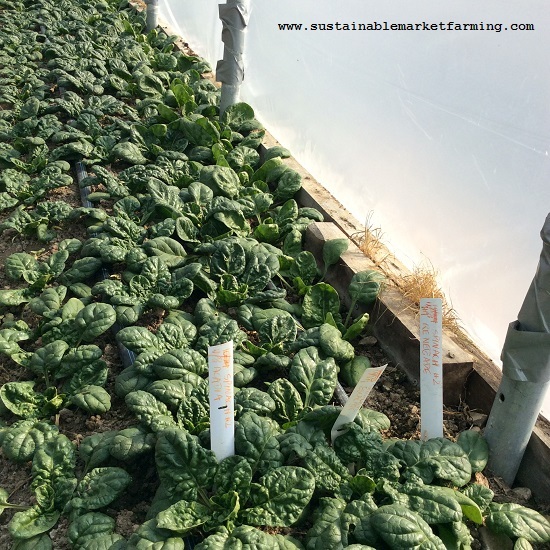 It could survive without the rowcover, but given that spinach makes growth whenever the air temperature is above 40F, and that the air under rowcover reaches that a lot more often then the air outside, we got much more growth using rowcover. We also got much better quality leaves, as they didn’t get battered by the weather. Tyee is bolt-tolerant too but tended to yellow, slightly tough, leaves in the fall. Tyee was dropped as a variety by the growers because (as I understand it) it suffered from a disease that is prevalent in the Pacific Northwest, where spinach seed is grown. It’s a hybrid, so we can’t just save our own seeds. We set out to try other varieties in order to find something to replace our beloved Tyee. I wrote about spinach varieties here in October 2016. We tried Chevelle and Avon. Chevelle didn’t do that well for us. Part of the problem was poor germination, which could have just been that one packet of seed. But the pressure was on to find a productive variety, so we gave up on Chevelle. We strongly prefer savoyed spinach over flat leaf spinach, because it has more loft in salad mixes and is more wilt-resistant after harvest. Apparently the East coast prefers savoyed spinach and the West coast the flat leaf kind, for what that’s worth. And of course, that takes no account of the millions of people between the coasts! Reflect spinach from a September 12 sowing, outdoors under rowcover after the -9F night in early January. Next we tried Avon and Reflect, and they seemed pretty similar, both have good flavor. Sounds like it might not do as well if water supplies run short once it gets hot. Bolting is initiated by heat, crowding and day-length over 14 hours. Avon claims strong bolt resistance. Reflect (38 days to mature) semi-savoyed hybrid is recommended by Johnnys as a good alternative to Tyee. It has much more resistatnce to various Downy Mildew strains (1-11, 13, 15, 16), but is “slightly” faster bolting than Tyee. This factor could be set against its very fast growing rate. Its color is a medium-green, less dark than some other varieties. This winter and spring we are trying Avon, Reflect, Renegade, Escalade and Acadia. Renegade (43 days mature) smooth leaf hybrid. Slower growing than Corvair, which it resembles in flavor. Does well in chilly damp conditions (our winter hoophouse?) Has resistance to DM 1-7. Bolt-resistant, dark green leaves. Escalade (43 days mature) slightly savoyed hybrid, with upright growth, claims high bolt resistance. Resistant to DM 1-14, 16. Slower growing than some. Expected to handle temperature and light variability. Good for baby leaf production (not what we do). The flavor is mild (not a good thing, for those of us who love spinach!) Will it grow fast enough in our short springs to give high yields before it bolts? We’ll let you know. Our second sowing of hoophouse spinach. Left row Avon, then Acadia, then Escalade, with Renegade nearest the plastic. Sowed 11/8, photographed 2/5. The winners (in order) in terms of yield were Pigeon, Space, Giant Winter, Tyee, Palco. These were followed, after a noticeable drop in yield, by Raccoon, Renegade, Donkey, then another noticeable drop to Corvair, Regiment, and a plummet to Bloomsdale Longstanding and Samish. Giant Winter and Bloomsdale Longstanding are the only OPs in the list. We grew Giant Winter once. It did grow enormous leaves, but was very quick to bolt. Unsuited to repeated harvests in our climate. 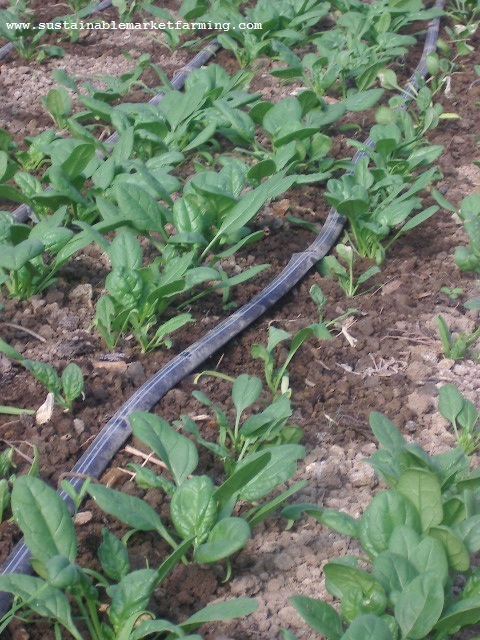 In 2011-2012, High Mowing Seeds in northern Vermont did a spinach variety trial with 24 varieties, assessing productivity, color and harvest time. The 24 varied a lot in earliness, upright growth habit or not, flat or savoyed leaves, and level of pest resistance. On color, America, Corvair, Crocodile, Donkey, Emilia, Lazio, Menorca, Queen, Raccoon, Red Kitten, Regiment, Samish, Seven Green, Space, Spargo, St Helens and Tyee scored 7 out of ten or better. Tyee only scored 7, Reflect only 4-5. The best were Corvair and Crocodile. Corvair had a good color and upright growth (clean leaves, easy to pick). Donkey was dark and productive. Giant Winter was a great early producer although poor on color (and terrible on bolt-resistant when we grew it in Virginia). Regiment gave high yields and had a good green color. Tyee had good savoy-ness but lower yield, although many other good points. Our first sowing of spinach in the hoophouse, photographed in late September. Reflect on the left, Avon on the right. 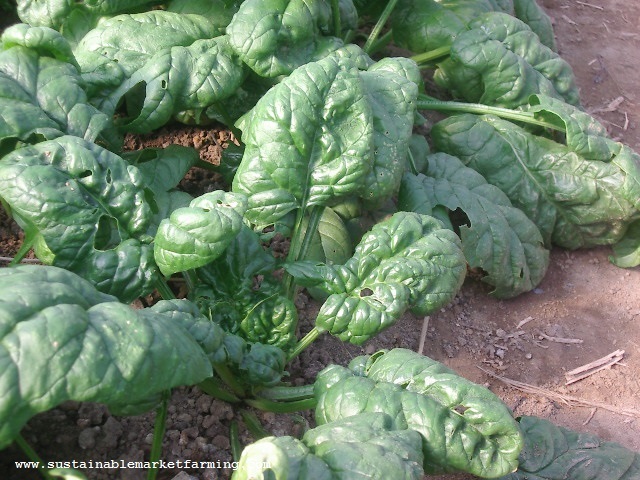 We are able to keep harvesting spinach from October 15 to May 25, all the way through the winter. 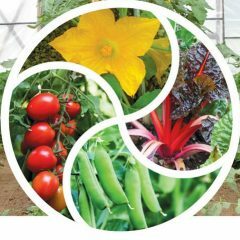 October 24 we make our second hoophouse sowing, to feed us November 25 to May 7. In 2017, we failed to water this planting enough, and had to resow November 8. November 9 we make a third hoophouse sowing, intending to use these plants to fill gaps in our hoophouse as other winter crops come to an end. January 16 we make more sowings in the hoophouse, some to continue to fill gaps there along the edges of the beds where they won’t fight with the tomatoes and so on, which we transplant starting March 15. Most of the spinach sown this date is for transplanting outdoors February 21. January 29 we sow in flats in the greenhouse if we see we haven’t got enough bare-root transplants in the hoophouse. If we don’t have enough transplants, then on February 10 we sow outdoors with rowcover, for spring harvests until May 25 if we’re lucky. We have backup plans on backup plans for this! In the hoophouse we continue transplanting spinach to fill gaps until March 31. 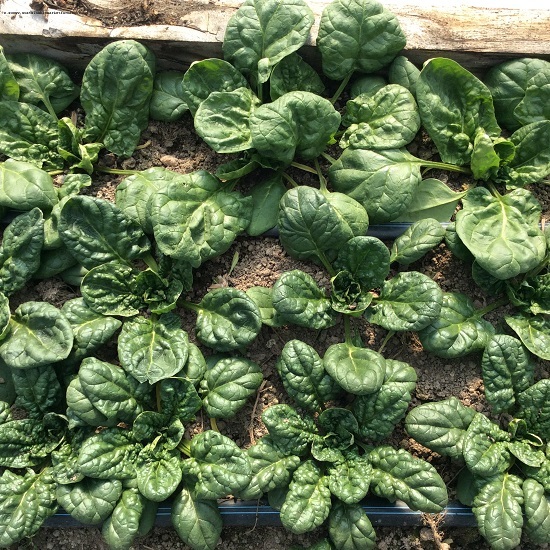 Hoophouse spinach #2. Front row (bottom of the picture) Acadia then Escalade then Renegade. There a few Canadian companies still carrying Tyee. I have not investigated if they ship to the US! This could give folks breathing room while they try a few other varieties for comparison. We bought your brilliant book but are just struggling with one thing – on pages 46/47 what are your bed widths? Without this we are nervous in translating how your 100 shares translates to our much smaller figure of 20 or 30 shares! Many thanks and we love the book!